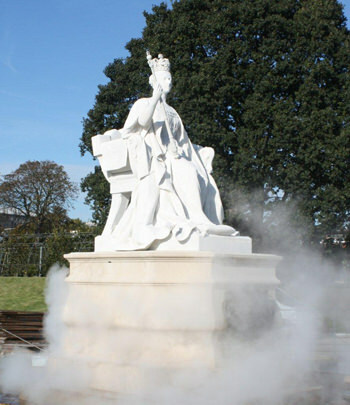 The modern superheated water system known as ThermaTech®, which is both UK designed and manufactured by us at Restorative Techniques, was used during the recent restoration project at Kensington Palace, for both cleaning (see picture) and also for some paint removal applications. ThermaTech is very effective at removing certain types of exterior paints, frequently without any chemical assistance, by using 'superheated water' at 150°C as the method, to both 'melt' and 'lift' many groups of 'modern' paints. It has been used at Kensington Palace particularly for paint removal, from some lower external elevations, prior to an application of a 'mineralic' paint product, which required a thorough and effective removal, of certain previously applied, paint coatings. When using superheated water for paint removal, it is important to not just achieve, but to continuously maintain, the very high water temperatures, that are crucial to the performance of this paint removal process. For cleaning applications, the high temperatures are also ideal and capable of both cleaning and to a degree 'sterilising' a substrate, which helps prevent a fast re-colonisation of algael soilings. The difference when using ThermaTech on the digital control option, means the water is far less prone to the larger fluctuations of heat, that are frequently seen with earlier version, analogue controllers. The particular digital controller that ThermaTech uses, detects far smaller changes in heat and in turn, controls the boiler far more accurately, resulting in higher temperature output and reliable performance. This system is very different and should not be mistaken with 'hot pressure washers' that generate large volumes of water, at far higher pressures and at much lower temperatures.